Fast-focusing and 4K-shooting, the Alpha a6300 from Sony is a versatile APS-C-format mirrorless digital camera designed for multimedia image-makers. Revolving around a redeveloped 24.2MP Exmor CMOS sensor and BIONZ X image processor, clean image quality is provided with a wide expandable sensitivity range to ISO 51200, along with accelerated readout speeds for internal 4K30 and Full HD 1080p120 video recording with full pixel readout. Stills shooters also benefit from the apt processing speed, which enables continuous shooting at 11 fps for up to 21 raw frames in a burst, as well as 14-bit raw file output. Complementing both stills and video, the sensor and processor combination also avails 4D FOCUS, which combines a wide-coverage 425-point phase-detection system with a 169-area contrast detection system for quick and precise focusing performance. This focusing system also enables High-density Tracking AF for more efficient and accurate tracking of moving subjects across the image frame. 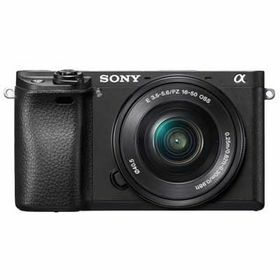 A well-rounded camera for both photographers and videographers, the a6300 is characterised by its speed and further qualified by its refined image and video quality. The apt 4D FOCUS system also lends itself to a variety of focusing functions for refined accuracy, including Lock-on AF, which maintains focus on moving subjects throughout the use of a configurable frame that is set over the desired moving subject, and Expand Flexible Spot, which employs neighboring focus points to retain focus on moving subjects even if the originally selected point loses focus. Additionally, Eye AF can be used to base focus on recognized subjects' eyes for portraits and is available in both AF-S and AF-C modes. Autofocus can also be used in conjunction with the Focus Magnifier function for critical focus when homing in on minute subject details.In addition to autofocus, the a6300 also features a Peaking MF function to benefit manual focus control by highlighted sharp edges of contrast for a more objective means of acquiring sharp focus.